These Semi Dry Blotters offer rapid transfer times for DNA, RNA and protein blotting - typically 15 to 30 minutes. All units can be used for all types of blotting: western, southern and northern via uncomplicated buffer and set up procedures and are compatible with gel thicknesses from 0.25 up to 10mm without the need for additional equipment. Each unit is compatible with their respective omniPAGE vertical gel system. Semi Dry Blotting has the added benefit of economic transfers due to very low buffer volumes – typically only a few millilitres of buffer are required per transfer. These Semi-Dry Blotters utilise a screw down lid, which secures the blot sandwich and allows complete control of pressure ensuring even transfer. The electrodes, comprising platinum coated anode and stainless steel cathode, will exhibit practically no corrosion and so provide many years of trouble free use. Uniform heat dispersion across the blot sandwich ensures stable transfer times and no heat induced sample loss or transfer distortions. 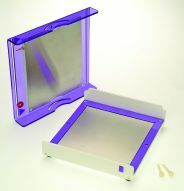 Being translucent, it allows viewing of the blot sandwich to ensure correct positioning and transfer is occurring correctly. 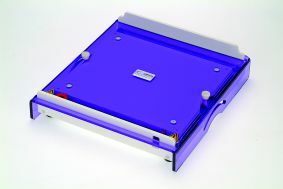 Electrode plates are fully separated to prevent arching or damage.